Padit Jasraj exquisite performances on this recording introduce us to the tradition of temple singing called Haveli Sangeet. The tradition derives from one northern India’s principle path of Krishna Bhakti, or devotion to Krishna. This path is called the Pushtu Marg or Way of Grace’, though it is also known as the vallabha sampradaya, the tradition or vallabha’, after its founder vallabhacharya, who lived from 1479 to 1531. Taking his inspiration from such venerated classical text as the Sanskrit bhagavata Purana, vallabhacharya bult up a cult or sectarian movement based on a devotion of mind body and wealth to Krishna. Krishna swarup or image, installed in the haveli (temple), became the focus of an elaborate programme of daily service on the part of his devotees. Unlike the generality of Hindu modes of worship called simply puja, vallabha concept of seva or service conceives of the deity not as a remote or abstract but as an honoured guest to whom the very best comforts and delights should be offered at all time. Thus Krsihna image is dressed and adorned according to the changing seasons, while his diet and the adornment of his shrine similarly reflect the time of year and the festival calendar. A programmed sequence of seva accompanies Krishna through his day for his being awoken in the morning to the time for repose at night. Vallabha second son vitthalanath further expanded the conventions of seva and promoted the new style of Krishna devotion to an ever-growing public of devotees. In the principle centres of the Vallabhi sect, this shrine service is to this day performed by the direct descendant of Vallabha himself. This is one of the most vibrant moving and aesthetically rich traditions of devotional Hindu life to be found in northern India today. Music has always been central to the traditions of seva in the Vallabha sampradaya. During the life time of Vallabha himself devout singer poets composed and sang their kirtans songs which simultaneously praised and delighted the image of Krishna in the havieli shrine. Eight of these poets some of whom are represented in these recording formed a central grouping called the ashtachhap or ‘Eight seal’ a title deriving from the chhap or signature of the poet whose name in the last couplet of the verse provides the traditional way of signing a composition. The language of these poets was the Braj Bhasha, a dialect of Hindi especially associated with the land of Krishna. 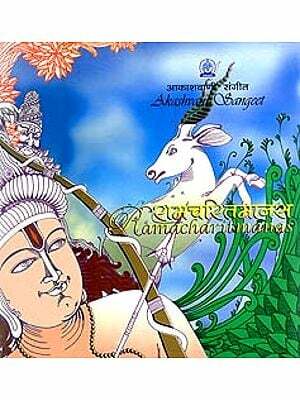 Braj Bhasha has a particular lyrical sweetness that combines with the eternal narrative of Krishna the cowherd god to make a uniquely accessible and satisfying form of sung poetry. 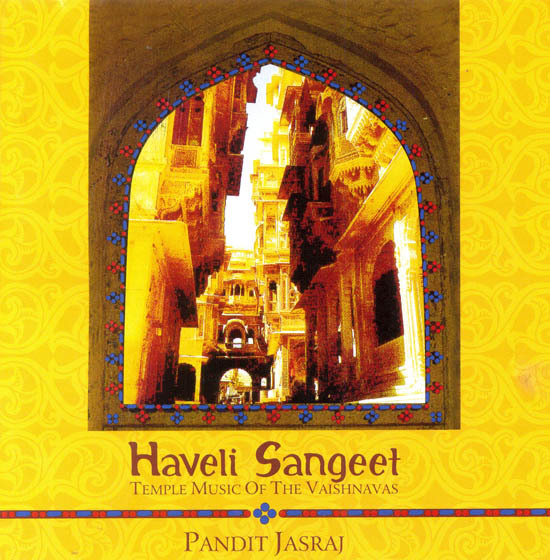 Although the style of music called Haveli Sangeet has long been performed in the havelis themselves the credits for bring it to the concert platform goes in large part to Pandit Jasraj. His unrivalled status as a classical singer ensures the highest degree of aesthetic refinement in his interpretations of this age old performance style. With his accompanists Pandit ji reproduces on stage a main singer is caught and repeated by the assembled devotees. The works of poets such as Chhitswami and Surdas, 16th century geniuses of word and syllable come alive for us again in the music of one of the greatest Hindustani singers of our won age. The fountainhead of the Mewati Gharana, Ustad Ghagge Nazir Khan belonged to the kingdom of Jodhpur in the Mewat region a part of Rajasthan. For this geographical reason the musical tradition that evolved under his influence, is today called the Mewati Gharana. This very tradition was passed on to Pandit Natthulala and Pandit Chamanlal (who died young). Pandit Natthulal Passed it on to Pandit motiram his nephew in the secrecy of dark jungles after the sung had set. This unusual training lasted for seven years. Pandit Motiram in turn passed it on to his brother Pandit Jyotiramaji (who later became a disciple of Ustad Rajjab Ali Khan) and to his sons Pandit Maniram and Pandit Narayan. Through rigorous training to Pandit Jasraj, Pandit Mnairam ensured that this proud legacy would be carried forward through time. Today the fact that it remains preserved through the ensuing trials is in itself a testimony to the sheer grit and determination that has gone into its preservation. Pandit Jasraj who has kept it alive to enthrall and exalt our spirits today is its voice, making sure that the future generations will imbibe its qualities and take it to greater height. The standards he has set put a heavy responsibility on his disciples. What will make it possible for them to make the Mewati tradition thrive in the time to come is his own exemplary genius his loving way imparting knowledge and more importantly his blessings. Today Pandit growing strength of disciples extends across the Indian shores. In fact he has established Pandit Jasraj school of music foundation in Vancouver and pandit Jasraj academy of music in New jersy, where he regularly visits and conducts training. Pandit Jasraj's exquisite performance on this recording introduces us to the tradition of temple singing called Haveli Sangeet. The tradition derives from one of India's principal paths of Krishna Bhakti, called the Pushti Marg or Way of Grace. This sectarian movement founded by the 14th century Saint Vallabhacharya is based on a devotion of mind, body and wealth to Krishna. Here the Krishna swamp or image, installed in the Haveli (temple), became the focus of an elaborate program of daily service on the part of his devotees. The term "Haveli" is used for all the temples of the 'Pushti Marga'. Track 1) followed by an incantatory dhun (Track 2) which sets the scene and atmosphere for what is to follow, namely, an unfolding of an evening of devotional songs performed in the Haveli Sangeet format. In this album three such songs are featured, performed in different classical raga based compositions on tracks 3, 4 and 5. This is an invocatory prayer at the start of a programme of devotional music. This Dhun, an incantation to Narayana, Rama and Krishna — all manifestations of Lord Vishnu, preceded by the invocatory prayer, is intended to create a calm, pure and peaceful atmosphere, fit enough to invite the presence of divine presence and glorify the event of human worship of the Lord. In this song, performed in Raga Puriya Dhanashri, the devotee pleads to the Lord, after expounding and praising his virtues, to grant him a place under His lotus feet, comparing the Lord to the giant tree and himself to fallen leaves lying around the trunk of the tree. Radha threatens Lord Krishna not to give back his (shepherd's) stick if he did not fill her ghata (clay pot) with water. Krishna, first agrees and then gently reminds her that He had once stolen the clothes of Radha and the Gopis when they were bathing in the river. This stuns Radha and she keeps looking at the Lord, not knowing when the stick fell out of her hand and onto the ground. This song is performed in Raga Gauri. Radha says that "as my heart has been stolen by (Lord) Krishna, I have no interest in my surroundings. After I have seen Him I am unable to think of anyone else; so much so that my life and my love — nothing is in my hands, nothing matters anymore; everything is meaningless in this world except my-love for Him." Pandit Jasraj is one of the most popular stars of Hindustani music today and undoubtedly one of its most outstanding talents. He was born in 1930, in Hissar in the state of Haryana, into a musical family. His father Pandit Motiram and elder brother Pandit Maniram were both vocalists, and it was his brother who completed his induction into the family tradition, which is referred to as the Mewati Gharana. Pandit Jasraj is blessed with the rare ability to convey the essential beauty of the music in a form which is always fresh and appealing to the listener. His superbly rich and sensuous voice and technical virtuosity are harnessed to a genuinely devotional spirit, as is evident from the performance on this album, making his music satisfying on many levels. Endowed with a rich, soulful and sonorous voice which effortlessly traverses over all three and half octaves, Pandit Jasraj's vocals are characterised by a blend of austere and opulent elements, projecting traditional music and an intense spiritual expression at once chaste and densely coloured. He has been guided by his spiritual guru, the late Maharana Shri Jalwant Singhji of Sanand. Perfect diction, clarity of sur (note) and command over all aspects of Jaya (rhythm) are other highlights of his music. He pays great attention to the choice of the composition and the words in it. This sensitivity together with his pure classical approach has given his music a lyrical quality, which is the quintessence of the Mewati style of singing. Both a traditionalist and an innovator, he places emphasis on maximising the music's expressive power, rather than on holding to traditional practice for its own sake. His biggest contribution to Indian music is his concept of a novel jugalbandi (duet performance) based on the ancient system of moorchanas, between male and female vocalists, each singing their respective scales and different ragas at the same time. This has been so highly acclaimed that connoisseurs of music in Pune have named it Jasrangi Jugalbandi. Pandit Jasraj has received numerous honours among the most recent of which is Padma Vibhushan, the second highest civilian award, form the president of India.